Talking Continents is a floating collection of 19 cloud-like, stainless steel sculptures. Their biomorphic forms are made of die-cut letters taken from nine different languages. Presented together, they refuse to come together as words, existing instead as abstract forms, arbitrary signs, and signifiers. As such, each sculpture embodies a dissolution of meaning or breakdown in communication. At the same time, the letters comprising the works are also the components needed to reconstruct words and create meaning—the building blocks for cultural understanding. 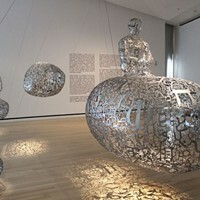 A firm believer that art has the capacity to transform our lives, Plensa has stated that Talking Continents represents the concept of globalism without judgment.